Choosing small motorhomes for Fulltime Rving can be challenging, but a small RV does have some advantages over the larger and longer ones. Let's look at some of the options for small motorhomes and the pros and cons of each choice. A Class B motorhome is a camper van and generally includes all the comforts of a larger motorhome with easy parking and drivability of a full size SUV or luxury van. Several well known brands of Class B motorhomes are: Roadtrek and Pleasure Way. These camper vans include your own bathroom, kitchen, living room, and bedroom. 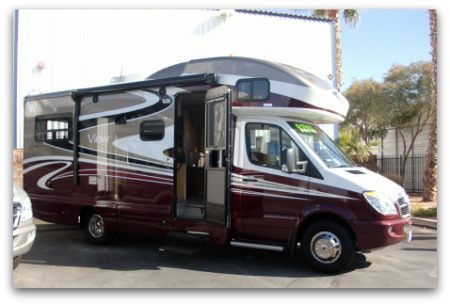 Class B motorhomes are terrific choices for fuel economy, parking ease, and boondocking. The Class B motorhomes have the ability to navigate more remote roads, and park where ever parking is legal. Although space is very limited if you're bringing only essentials with you these vans can be a good full timers option, but can you really live in such small motorhomes? 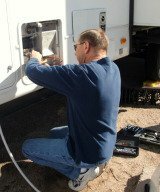 Most folks who choose a Class B motorhome cook, sleep and travel in their RV, but spend most of their time outside the RV. If you love out of the way places, and boondocking, then this could be a good choice as a full time RV. The Class B plus such as a Trail-Lite B Plus, or the Itasca Cambria Class B Plus are slightly larger yet compact and versatile motorhomes that are easy to drive yet offer more living space. The Class B plus offers a more spacious interior, is fully furnished with a fully equipped galley, bath, sofa, dinette, entertainment center, and sleeping areas. The Class B plus has more storage space than the traditional Class B motorhome. Most will include large exterior pass-through storage compartments to store all your camping gear and supplies. 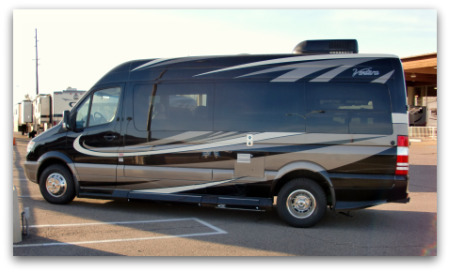 Class B plus motorhomes can be equipped with slide-outs offering a more spacious living area when parked. Although you won't fit into traditional parking spaces with the slides out. These motorhomes are generally less than 30' long and can easily fit into tight spots in National Parks. These B plus motorhomes have an amazing amount of comfort in a compact size, and are great value in a fun size and a less expensive price than a class a motorhome, they are equipped with all the essentials and lots of extras. For slightly more living area and storage this might be a good option for RV living for those who have a little more gear to tote. One popular choice in a B-plus is the Phoenix Cruiser motorhome. If you're looking for a motor-home built for two these spacious RVs can go places the larger ones wouldn't. It's a great choice for traveling back roads and small towns. They are easy to drive, get good fuel economy, and include many luxury features. Class C motorhomes offer plenty of options from traditional c class, super c, and luxury C Class motorhomes. These motor homes have spacious living space and are equipped with a kitchen, bathroom, and bath. There are options for rear bedrooms in addition to the over the cab sleeping areas. 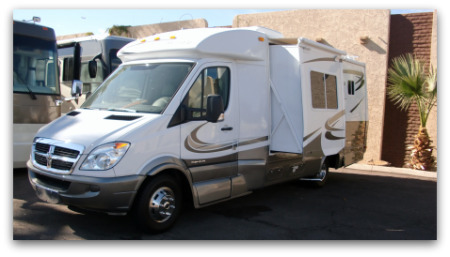 You have towing capabilities with a Class C motorhome. Class C motorhomes are generally cheaper than a class motorhome. Most are very comfortable and spacious, they can be easier to maneuver than a class a or longer fifth-wheels or travel trailers. The price can still be steep for newer models with slide-outs, but they are an excellent option for full timers deciding on small motorhomes. Older models are not very aerodynamic, and therefore get poorer fuel economy, but the newer versions accommodate high-end features in a smaller space with a better aerodynamic designs for a small RV. Truck bed campers while not technically a small motorhome can be a practical alternative for full time RVing.